Walgreens, CDW, Freedman Seating and Rush University Medical Center will provide jobs with career pathways to program participants. The City Colleges of Chicago will provide education opportunities and targeted skills training. These “earn and learn” opportunities, combined with mentoring and support from The Chicago Urban League, One Million Degrees and Cara will provide youth with the support necessary to succeed in employment and advance their careers. Through Beyond the Diploma, Skills aims to place 1,125 high school graduates into jobs. Recruitment has commenced to fill Beyond the Diploma opportunities at Walgreens. Walgreens is the lead “beacon” employer partner for Beyond the Diploma, and will serve approximately 25 Chicago youth in its first cohort, with additional cohorts planned for the future. Participants are scheduled to commence work at Walgreens in spring 2018 and begin classes at City Colleges in the summer. Youth ages 18 to 24 can apply at scfjobs.com/pivot. 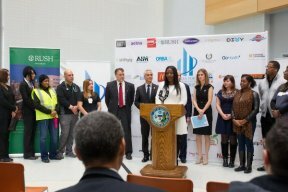 “This unique partnership will offer Chicagoans steady incomes, a quality education, and upwardly-mobile career paths with leading employers, and is central to our vision of creating more earn and learn opportunities for our students moving forward,” said City Colleges of Chicago Chancellor Juan Salgado.